This is a step-by-step Recipe for making at home sweet, tasty and delicious Mithai Shop Style Butterscotch Burfi. 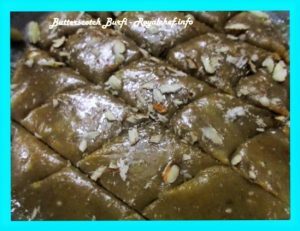 This Burfi is simple and easy to prepare and once you have all the ingredients in place. For the Caramel: Heat a tablespoon Ghee in a Kadai and add the Cashew nuts and fry for two minutes and then remove from a flame. In a Kadai add the Sugar and heat it until the colour changes into brown. Then add the fried Cashew nuts and mix it well. Apply the Ghee over the plate. Remove the mixture from the flame and pour over a Plate and pat it evenly. When it well cool then grind into the grinder. For the Burfi: In a Kadai add the Khoya and saute for 3-4 minutes on a slow flame then add the Sugar and mix it well. Then saute the mixture until it become a thick. 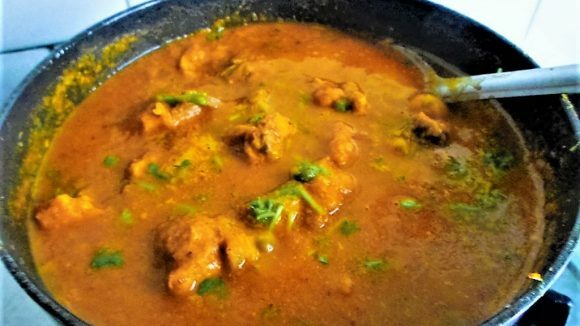 When the mixture will thick then add the Cashew nut mixture, Yellow Colour, Butterscotch Essence into it and mix it well. Apply the Ghee over the stainless steel plate. And then pour the mixture over the plate. Keep the plate aside for cooling. When the mixture will cool down then cut the Burfi into 8 pieces.